BIG SALE!! STATIONARY LED LIGHT STANDS BIG SALE!! This upscale LED light stand can be used as a party light coaster, bottle glorifier or as an ordinary light base. Draw attention to any crystal or glass centerpiece to create excitement or a party setting. This stand has a Black base with sturdy clear top and silver interior where 4 extra bright LED lights in Red, Blue, Yellow and White produce a continuous twinkling light show for an eye-catching effect. The base has a pressure sensitive on-off switch that requires at least 4ozs to turn on the lights. 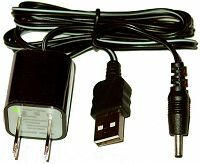 The 4.5 volt AC adapter is included or use 3 AAA batteries for days of continuous use. Batteries are not included, click for AAA batteries. These gorgeous, faceted, round Lucite Crystal LED light bases will enhance the appearance of your favorite or most upscale sculptures, art and crystal pieces up to 20lbs! They are solid clear acrylic Lucite with a flat top and shiny chrome interior where 7 extra bright LED lights, 2 red, 2 blue, 2 yellow and 1 green in the center produce a state of the art twinkling light show by blending the large 7 LED color lights. Boxed with a 5 volt AC adapter included. 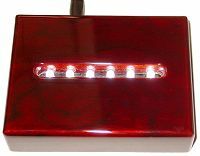 This mirror top LED Light base is 4" W and has next generation BLINDING LED lights in White, Red, Blue and Green to illuminate your favorite crystals, art pieces or memorial glass! Choose from 10 different light shows by pressing the toggle button. There is an on-off switch on the side. 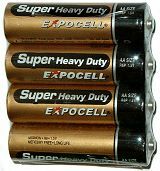 Use 3 AAA batteries for days of continuous use or plug in with the electric cord that is sold separately. Buy Electric Cord only. 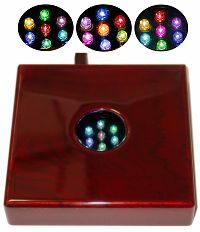 Light up your 2D glass photos, awards, crystal and agate slabs with this slotted white 6 LED light stand. 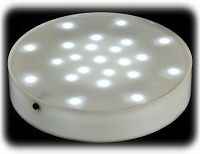 The 4" long open ended slot top is slightly slanted and 1/2" wide with 6 extra large white LED lights that produce super bright, continuous light with NO twinkling. The base is 4 1/2" L by 2 3/4" W with an On/Off switch on the back and 4.5 volt AC adapter included. Glass sample not included. Excellent 7" round, white LED light stand is a perfect table centerpiece for vases, crystal or any large or heavy item you wish to highlight. 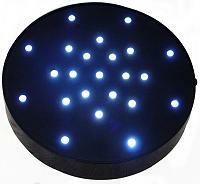 It has a black base with 23 extra bright white LED lights that remain fully lit and do not twinkle. There is an on-off switch on the side and it is fully portable. Use 3 AA batteries for days of continuous use. Batteries are not included, click for AA batteries. Now in translucent white, this 7" round, white LED light base is a sturdy table centerpiece for vases, crystal or any large item you wish to highlight. 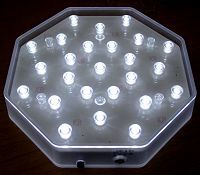 It has a white base with 23 extra bright white LED lights that remain fully lit and do not twinkle. There is a push button on-off switch on the side and it can hold heavy objects of 15lbs or more. Use 3 AA batteries for days of continuous use. Batteries are not included, click for AA batteries. Large 6 1/2" wide octagon, white LED light stand is an affordable heavy duty table centerpiece for vases, crystal or any large item you wish to highlight. The clear flat 6 1/2" W top has 25 super bright white LED lights that produce continuous light with NO twinkling. The clear frosted base is also lit up, allowing the light to be visible on all eight sides. This portable LED display stand has an on-off switch on the side and requires 3 AA batteries for days of continuous use or plug in with a AC 4.5 volt adapter. Batteries are not included, click for AA batteries. This high quality, large full spectrum, octagonal LED light stand offers a professional, eye catching look for your larger sculptures, vases, art pieces or paperweights! 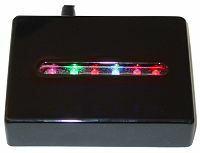 It has a shiny black base with a flat clear top over a silver interior where 4 LED lights in Blue, Red, Green and Yellow produce a state of the art twinkling light show by blending the large 4 color LED lights. Boxed with a 4.5 volt AC adapter included or use 3 AA batteries for days of continuous use. Batteries are not included, click for AA batteries. Now in stock our large 5" square wood light base with 7 extra BRIGHT white lights in a size suitable for larger and heavier crystal balls and art glass. This custom made, hand crafted wood light stand in black lacquer finish has an on/off switch, a plush velour base for scratch protection and is gift boxed with a 4.5 volt AC adapter included. 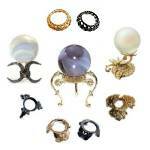 Holds 3" to 8" wide spheres, eggs and heavy crystal or glass. Many of you requested the above best selling wood light base in an elegant Cherry finish. 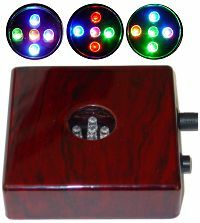 The hand crafted base has 6 extra bright white LED lights that stay on and do not twinkle with an on/off switch, a plush velour base for scratch protection and comes with a 4.5 volt AC adapter in a silver gift box. 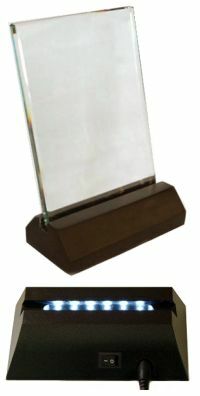 Place your awards, 3D photos, paperweights or art glass on gallery quality light stands. The same popular wood light base as above is now available in elegant Cherry finish. The base has 8 extra bright white LED lights that stay on and do not twinkle with an on/off switch, a plush velour base for scratch protection and comes with a 4.5 volt AC adapter in a silver gift box. Place your awards, 3D photos, paperweights or art glass on gallery quality light bases. Now available in Cherry finish, this large 8" wide wood light base has 11 extra bright, white LED lights that stay on and do not twinkle. This hand crafted wood light stand has an on/off switch, a plush velour base for scratch protection all in a silver gift box with a 4.5 volt AC adapter included. Show off your 3D photos, memorial glass or art pieces with elegance. For the Modernist look, this upscale rotary light stand fills the bill! A stunning black finish base rises in ziggurat form to the top, where your most treasured sculpture, art or glass piece gets all the attention! The stand includes a removable revolving 5" wide turntable with beautiful kaleidoscope colors flowing from below that change slowly. The center opening can hold round crystal balls or eggs securely. This gallery quality light base has 2 settings with "Light On Only" or "Light On Rotating". Gift boxed with a 12 volt AC adapter and 12W halogen light included. The 12W halogen light bulb can be replaced. 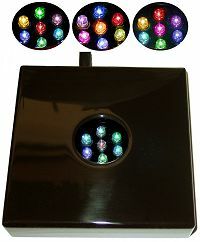 This extra large 7 1/4" W rotating (1RPM), mirror top LED light stand has a brushed silver base and a flat surface rotating mirror top with 7 COLOR LED lights in the center and 8 COLOR LED lights evenly spaced in an outer circle. The LED lights are extra bright red, green, blue and yellow which produce a full spectrum random light show to highlight your treasured piece. 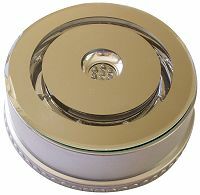 The light base can hold sculptures, crystal, art pieces or paperweights up to 4lbs and has 2 settings with "Light On Only" and "Light On Rotating". Base is 7 1/4" W, the rotating mirror top is 6 1/2" W with a toggle and an On/Off switch on the side. Gift boxed with a 6 volt AC adapter included. This extra large 7 1/4" W rotating (1RPM), mirror top LED light stand has a brushed silver base and a flat surface rotating mirror top with 7 WHITE LED lights in the center and 8 WHITE LED lights evenly spaced in an outer circle. The extra bright WHITE 15 LED lights produce twinkling yet continuous white light to highlight your treasured piece. 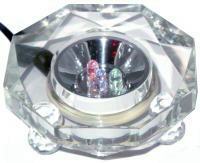 The light base can hold sculptures, crystal, art pieces or paperweights up to 4lbs and has 2 settings with "Light On Only" and "Light On Rotating". 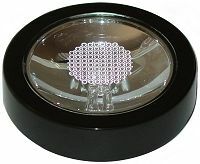 Base is 7 1/4" W, the rotating mirror top is 6 1/2" W with a 2 setting On/Off switch on the side. Gift boxed with a 6 volt AC adapter included. This extra large 9" W rotating (1RPM), mirror top LED light stand has a brushed silver base and a flat surface rotating mirror top with 7 COLOR LED lights in the center and 12 COLOR LED lights evenly spaced in an outer circle. The LED lights are extra bright red, green, blue and yellow which produce a full spectrum random light show to highlight your treasured piece. The light base can hold sculptures, crystal, art pieces or paperweights up to 6lbs and has 2 settings with "Light On Only" and "Light On Rotating". 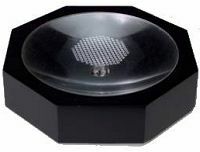 Base is 9" W, the rotating mirror top is 8 1/4" W with a toggle and an On/Off switch on the side. Gift boxed with a 12 volt AC adapter included. 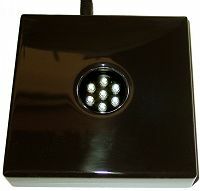 Replacement electric cord for LED-60 or LED-70 LED light bases. This versatile 2 piece cord has a detachable USB wall adapter and is 4' 3" long. This extra large 9" W rotating (1RPM), mirror top LED light stand is now available in WHITE light only. The brushed silver 9" wide base has a flat surface rotating 8 1/4" wide mirror top with 7 WHITE LED extra bright lights in the center and 12 WHITE LED lights evenly spaced in an outer circle that produce twinkling yet continuous white light. It hold sculptures, crystal, art pieces or paperweights up to 6lbs and has 2 settings with "Light On Only" and "Light On Rotating". There is a toggle rotary switch and an On/Off power switch on the side. Gift boxed with a 12 volt AC adapter included. Next generation tech meets old world hand crafting! Large 5" square heirloom quality wood light bases in Black or Cherry lacquer finish have 7 color LED lights that individually change colors slowly to create a TRUE RAINBOW light show. Each LED light transitions slowly through multiple colors including blue, red, yellow, green, pink, purple, orange and more. The stand has an on/off switch, a plush velour base for scratch protection and is gift boxed with a 4.5 volt AC adapter included. Holds 3" to 8" wide spheres, eggs and heavy crystal or art glass. Next generation tech meets old world hand crafting! 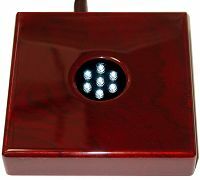 Large 5" square heirloom quality wood light bases in Cherry or Black lacquer finish have 7 color LED lights that individually change colors slowly to create a TRUE RAINBOW light show. Each LED light transitions slowly through multiple colors including blue, red, yellow, green, pink, purple, orange and more. The stand has an on/off switch, a plush velour base for scratch protection and is gift boxed with a 4.5 volt AC adapter included. Holds 3" to 8" wide spheres, eggs and heavy crystal or art glass.